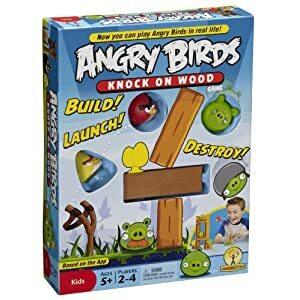 Sorry, we are currently sold out of 'Angry Birds Knock On Wood Game'. Still In Time for Pre Christmas Delivery! Build, launch and destroy with an exciting skill-and-action Angry Birds Knock on Wood Game based on the best-selling phone app. Game features three Angry Birds, green pigs, one slingshot-style launcher, structure pieces and mission cards. Players draw a card and build the structure shown before their opponents launch an Angry Bird in an attempt to knock it-and the pigs-down to win points. The survival of the Angry Birds is at stake. Dish out revenge on the green pigs who stole the Birds' eggs. These wingless birds, based on the hit mobile game app from Rovio, are a little upset and need your support. Despite all their anger, they're all just too cute to pass up. Pick your favorite character or collect them all!